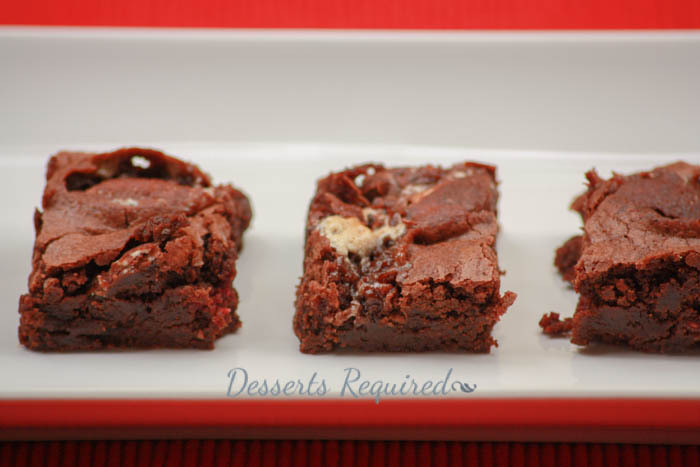 Samuel’s friend, Ben, helped me come up with the idea for Raspberry Marshmallow Brownies. I love the way 8-year olds think. I was going to make a brownie/raspberry cheesecake bar but Ben piped in that he does not like cheesecake. Samuel was eating marshmallows at the time and I thought they would work quite nicely with the raspberries and chocolate. One of Samuel’s favorite recipes is my Marshmallow Monstrocity Cups. They look like a near explosion from the marshmallows but the taste is incredible. I was not interested in replicating the look, but borrowing the taste and adding to it was a whole different story. When it comes to raspberries, I just can’t get enough of them. 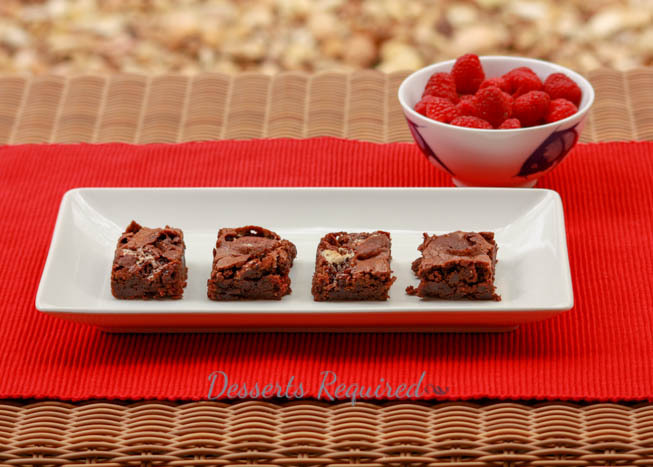 Raspberries have played a big part on Desserts Required. If you haven’t tried Brownie Raspberry Chambord Whipped Cream Trifle, Lemon Raspberry Cake, Raspberry Ginger Cake and Raspberry Cheesecake yet, what have you been waiting for? 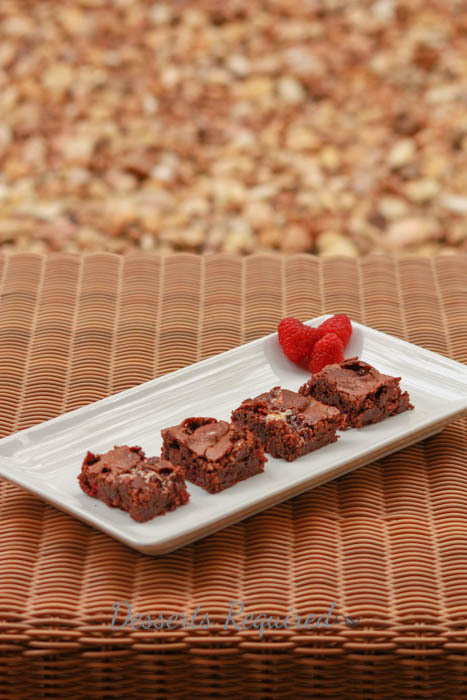 Perhaps you were waiting for these Raspberry Marshmallow Brownies. 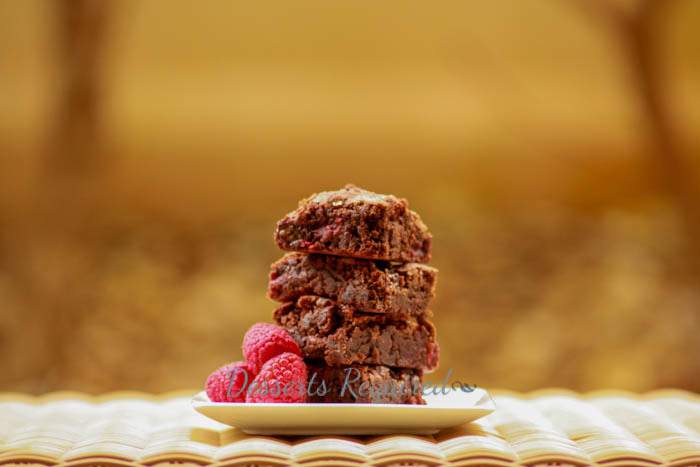 Combining a childhood favorite, marshmallows, with chocolate and raspberries is pretty darn irresistible. The tough part is remembering you are supposed to share these with the kids! Preheat the oven to 350°. Spray a 9” x 13” baking pan with nonstick cooking spray and line the pan with parchment paper. Set aside. Quarter the marshmallows and set aside. Melt the butter and chocolate in the microwave. Set aside to cool for 10 minutes. Place the eggs, salt and sugar in a large mixing bowl. Beat to combine. With the mixer on, blend in the chocolate mixture. Add the vanilla. Lastly, mix in the flour and baking powder. Transfer ½ of the batter to the prepared pan. Spread with a small metal spatula. Place the marshmallows on the batter then place the raspberry halves in between the marshmallow gaps. Spoon the remaining batter over the marshmallows/raspberries. Use a small metal spatula to spread the batter gently over the entire surface. Bake at 350° for 30 minutes. Remove from the oven and cool completely. Refrigerate until cold. Lift the parchment paper out of the pan and place it on a cutting board. Cut into 28 pieces.